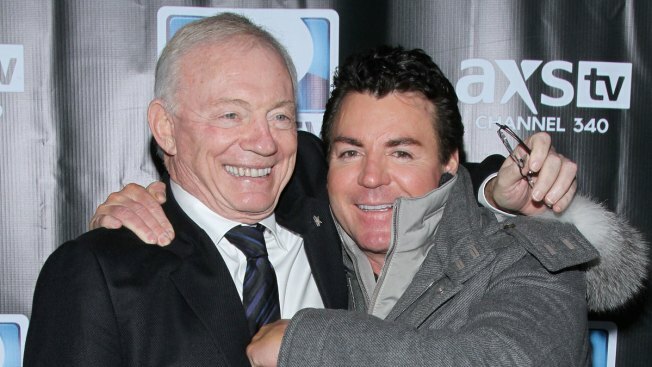 Dallas Cowboys owner Jerry Jones and John Schnatter attend the DirecTV Super Saturday Night at Pier 40 on February 1, 2014 in New York City. Schnatter, echoing what Trump has said on Twitter, said the controversy is hurting NFL ratings. He said Papa John's has hired a new creative agency that will help it create more digital ads. How is there controversy over Papa Johns pizza? I thought there was bipartisan agreement that it's disgusting. "The controversy is polarizing the customer, polarizing the country," he said. A representative for the NFL did not immediately respond to a request for comment Wednesday. Commissioner Roger Goodell and several owners said at the league's fall meetings last month that they did not discuss altering the anthem policy language from "should stand" to "must stand." Other companies don't see the NFL as a problem. Executives at chicken wing chain Buffalo Wild Wings Inc. said last week that the company didn't expect declining NFL viewership to hurt a key sales figure. And Kohl's, the department store operator, said it is working with the NFL on a holiday ad campaign. "What we see is a lot of our shoppers and prospective shoppers are watching NFL so that is what is behind the decision," said Greg Revelle, the chief marketing officer at Kohl's. "We are very confident." As for Papa John's, it reported late Tuesday that third-quarter sales rose 1 percent at established locations in North America, which it said was below what the company had expected. In the same period a year ago, sales rose 5.5 percent at established locations. Shares of Papa John's International Inc., based in Louisville, Kentucky, fell $6.60 to $61.45 on Wednesday.